Nevada horseplayers continued to bet into Churchill Downs and Magna Entertainment track pari-mutuel pools Wednesday as TrackNet extended its current contract with casinos until Jan. 25. TrackNet, which is a joint venture between Churchill Downs and Magna Entertainment, is locked in a struggle with casinos over new pari-mutuel contract terms. The track operators want higher fees and would like to change the way casino betting handle is reported, according to a story on Bloodhorse.com. TrackNet threatened to suspend pari-mutuel betting to some 80 casinos Wednesday because the previous contract expired and little progress was being made on the new one. Casino managers were prepared to book bets at Santa Anita, Gulfstream, Golden Gate and Fairgrounds. Casino representatives met with TrackNet leaders Wednesday and will continue to negotiate over the next couple of weeks, said Patty Jones, the executive director of the Nevada Pari-Mutuel Association. 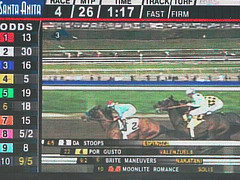 “Both sides came away with a better understanding of the other sides position,” Jones told Bloodhorse.com.